Winter is when fishing the ocean beaches come alive. The most popular fish to target from the beach at this time of year are bream, tailor and Salmon. Jewfish and Flathead are always a welcome by-catch and most can be taken on similar baits. 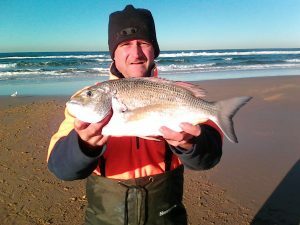 The best baits for bream at this time of year from the beach is pipis, yabbies or worms. Fish baits such as mullet will also produce results. The most activate fishing beaches are Stockton (Birbui), One-mile, Samurai, Box Beach and Fingal Bay. The beach offers certain structure in the form of gutters, holes and banks. Fish move into the different areas of the beach during certain times in the tidal flow. On the low end of the tide look for deeper holes and gutters, during the top of the tides work the banks that are connected to holes and gutters which allows the fish access to feed. Tuesday is a Duffs Tips day – Yesterday Ross spoke about our wonderful beaches and the many species that can be taken from them, specially he mentioned bream and considering the time of year we are in bream are a perfect fish to target. One of the best baits from the beach is the pipi which are found on many of our beaches. 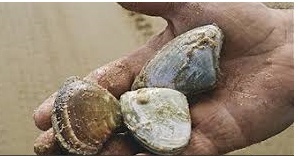 The pipi is a shellfish, basically an enclosed shell with contains the pipi flesh. The bream swim close to the shore and crush the shell with their mouths to get to the flesh. When fishing you open the pipi and remove the flesh, todays tip is to open the pipi from the short side, which will prevent the knife cutting into the bait part of the pipi flesh. Monday, I spoke about bream from the beaches, today’s topic is tailor and Australian Salmon from the beaches, these fish are both pelagic species and are very active during the winter months. These fish are aggressive and are a highly rated fighting fish. Tailor is considered a fare table fish if handled correctly although Australian Salmon lacks table quality, it is used for dishes such as fish cakes due to flesh that tends to hold together. Hence Australian Salmon are commonly known as ‘Fish cakes’. Fish baits are the most popular baits, specially pilchard presented on a gang hook rig, in reality any fish bait will work. Metal surface spinners are also effective, if there are sign of surface action such as birds working or the fish breaking the water a lure is worth a throw. The most activate fishing beaches are Stockton (Birbui), One-mile, Samurai, Box Beach and Fingal Bay. Look for deep hole or gutters or perhaps rock structures. The common method of tailor fishing to using a full pilchard on a set of ganged hooks. Ganged hooks come in varying sizes and are hooks crimped together through the eye of each hook. The tip is to use 4 hooks to make a set of gangs as opposed to the standard 3. Having this extra hook will increase your hook up rate as tailor tend to attack the pilchard from at the tail. 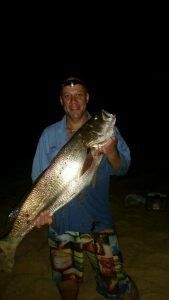 Today we are talking about Mulloway (Jewfish) from our beaches. 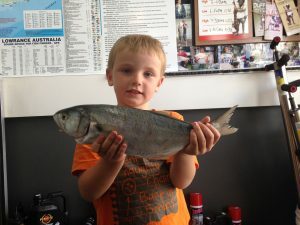 Every fisherman wants to catch a big fish and the Mulloway is a highly prized and targeted pecies. These fish grow to over 50kg with fish of 25kg rather common. These huge fish can be taken from the ocean beach on live baits, dead bait or a tiny piece of beach or bloodworm on a size 4 hook. If your serious about catching a big Jew then you need to target them specially which will limit your by-catch. Using live fish baits, squid baits or slab baits sharks and rays become more common as well as larger salmon. 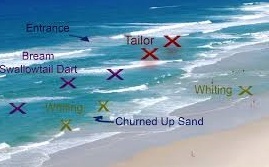 Targeting big Jew requires planning such as location, tides, bait and moon phases which all play a part. When picking a location this is the easy part, simply fish on a beach that has previously been known to produce Jew, hence this environment is one they favour. Bait can be various, I for one try to use what’s naturally available to them, if the tailor are in numbers on the beach then tailor or tailor heads are the way to go. You need to be persistent and perhaps document what’s working and why so you can compare year on year. They commonly like deeper gutters and hunt during a bright moon phase. All this being said you are likely to snag one on a beach worm fishing for whiting. The best Beachs for Jew Stockton in the deeper water towards the Stockton Break wall, One-Mile and Samurai beaches. Fingal is a beach many larger Jew have been taken from an should be considered s good starting place for a bigger fish. Remember as the fish get larger their eating quality diminishes, in my opinion a fish of 6kg is a fine table fish. Rigs for beach fishing are wide and varied from gang hooks for tailor , Snell rigs for large baits to the simple and most effective paternoster style. This particular style of fishing rig has the sinker positioned at the bottom of a main line with 2 individual hooks swinging free above the sinker. 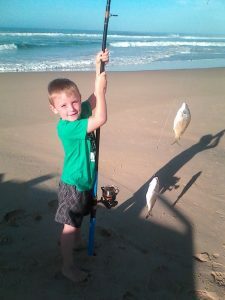 The advantage here is while fishing the beach the rig is held in the sand by the sinker, when the fish hits the bait then the weight of the sinker helps to set the hook, especially if the rod is set in a holder. I recommend, and use, no. 4 mustard bait holder hooks with 20lb f/c leader. A heavier leader prevents line twist and knotting. Bream and whiting will freely take baits with heavier leader in surf conditions. In my view this is the best style of fishing rig when targeting bream and whiting, also 20lb. leaders are more than suitable to handle bigger jewfish, rays , salmon and sharks.